Europa Park's New Coaster for 2009- Announced! : Theme Park News & Construction! 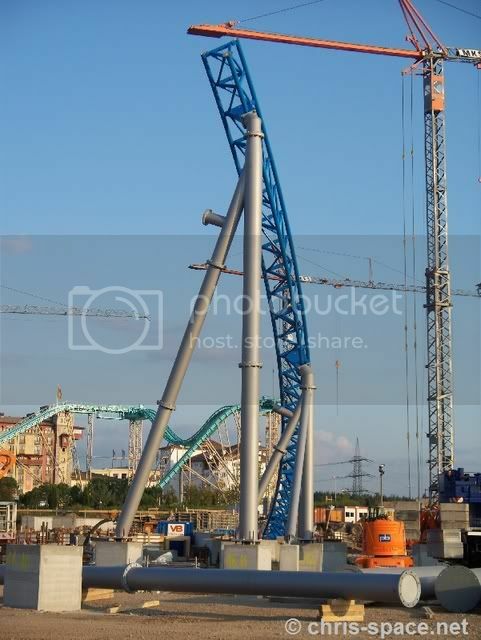 Europa Parks website has posted Teasers about the new ride, saying, "The ride of your life: World's first 2009." The ride is a prototype design from Mack. Roland Mack also gave these words to a local German newspaper. "The park will be enlarged with 70-85 hectares which are now still situated outside the park's boundaries. For this to happen, the access road will be moved. The centerpiece of the new themed area will be a new roller coaster. The ride will feature elements and techniques, never seen before." Teasers also hint that the ride launches you at 2.5 seconds and includes inversions. There has not been an official press release yet. Europa Park is owned by Mack GmbH, and in many cases they use the park to showcase their rides. All of the coasters in their collection (a total of nine) are made by Mack, except for Silverstar, a B&M Hyper. Last edited by Austin on November 5th, 2008, 4:41 pm, edited 1 time in total. Mack's version of a launched eurofigher? Mack? you would think as long as I've been into coasters i would have herd of this company by now, but this is the first time I've herd that name. ^ Thye pretty much make all wild mouses for the most part. And spinning coasters with more than one car. ... And water coasters. It will be very interesting to see a large scale coaster for them. ^^^ Ahh, thanks for clearing that up! Now I feel slightly less noobish. I have always admired their workmanship and interesting concepts. I am very interested in this ride. You haven't heard of Mack? This looks like it might become the economy accelerator coaster so to speak. I really want to see them do a big ride, this one should be interesting. this one looks good! MAck are really good and also practicly every ride in europa park is MAck! Right. Anyway, I can't wait to see more about this! It will actually make a 10+ hours trip to europa park worthy! It's worth it now as well, in my opinion. Europa Park is just awesome. Great theming, nice attractions. And with this complete new area, they are just going to get better and better. The park is pretty big now, but with this going to be added.. Wow, just great. and also i said mostly, not every, but yeah there is 2 rides that arn't or 1 or 3,I'm not really sure! or 7 or 4 or 19! Dude you need to capitalise, space and spell properly, it's kinda annoying. Anyway! I think that this is gonna be pretty cool, although I must admit that i was not aware that mAck did all those things, I mean, I was aware of the fact that they did water coasters, but I didn't really think on it about the other stuff. Oh well. Europa Park = Mack. They use it as there showroom. And the last ride in Europa Park, Pegasus is so darn smooth, that it's pretty promising where this will lead. The start of the first uphill. Maybe some kind of tophat, idk. Looking good.. I cant wait to see what the lay-out and train style will be. Shall it spin and such? eh... spinner invert? that wouldn't go that well... im really anxious to see the layout and what the trains will look like. looks like a fun ride. If you look in that pic Austin posted, look at the support. There is a track connection point right to the bottom left. I wonder why that is there as if it is track it looks way to close to the other track piece. Another support connection piece dingus. Also looks can be deceiving. www.epfans.info has posted new pictures of the ride! The first turnaround is complete along with a section of an inversion possibly?